Mean Machine face their biggest challenge in the ongoing Varsity League this weekend when they head to Egerton University for cup semis against the hosts. Machine head coach Ramsfield Matekwa maintained a number of those who started the tournament three weeks ago including fly-half Festus Shiasi and fullback Trevor Asina. 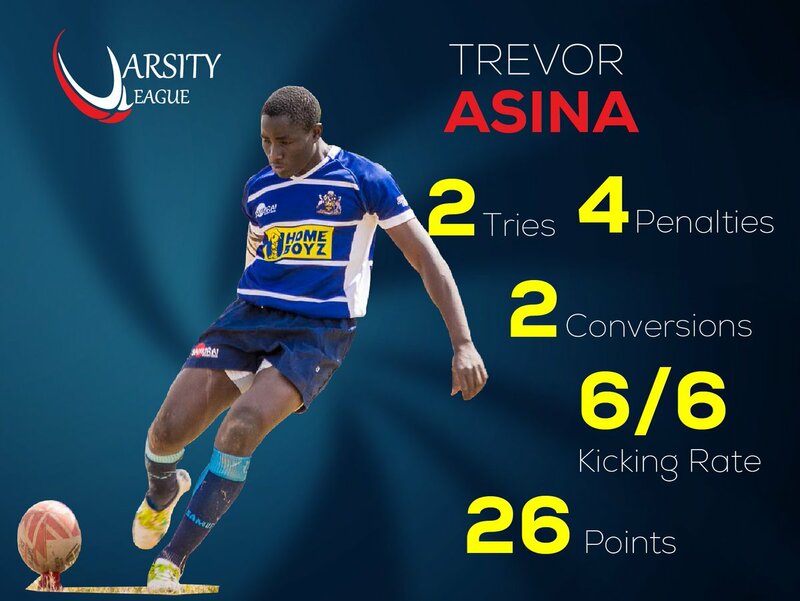 Asina has 100% kicking rate in the Varsity League having ticked all his six attempts. He has contributed 26 points from two tries, four penalties and two conversions so far according to Ozone Stats. Ben Mwangi will captain Machine since Shadon Munoko is heading to Floodies. On-form Aron Otieno starts at number 8 while scrum-half of the day will be Antony Abonyo. Egerton Wasps managed to qualify for semis by finishing second scoring only three tries in the three matches played. Fullback Brian Ndege has had a 40% kicking rate as he has sent two penalties in out of five attempts and will be required to be on top of his game against the Kenya Cup side. Egerton have Edwin Kimutai at fly-half with skipper Bramwel Omwangu starting at OC. This match will kick off at 12noon with the second semifinal featuring Blak Blad and Catholic University going down at 2pm.